Georgia State’s Associate Provost for Strategic Initiatives and Innovation Dr. Mary Beth Walker has been named interim president of Georgia Gwinnett College by the University System of Georgia on Jan. 12, 2019. Walker is taking over for Dr. Stanley Preczewki, who’s resigned to lead Riverside Military Academy. University System of Georgia’s Chancellor Steve Wrigley, a Georgia State graduate who was on board with the Georgia State and Georgia Perimeter merge, invited Walker to step into GGC’s presidential role. During Walker’s time at Georgia State, she served as dean of the Andrew Young School of Policy Studies from 2010 to 2017, increased the volume of externally funded research grants awarded to the school and integrated the School of Social Work and the department of Criminal Justice and Criminology to Andrew Young, among other accomplishments. 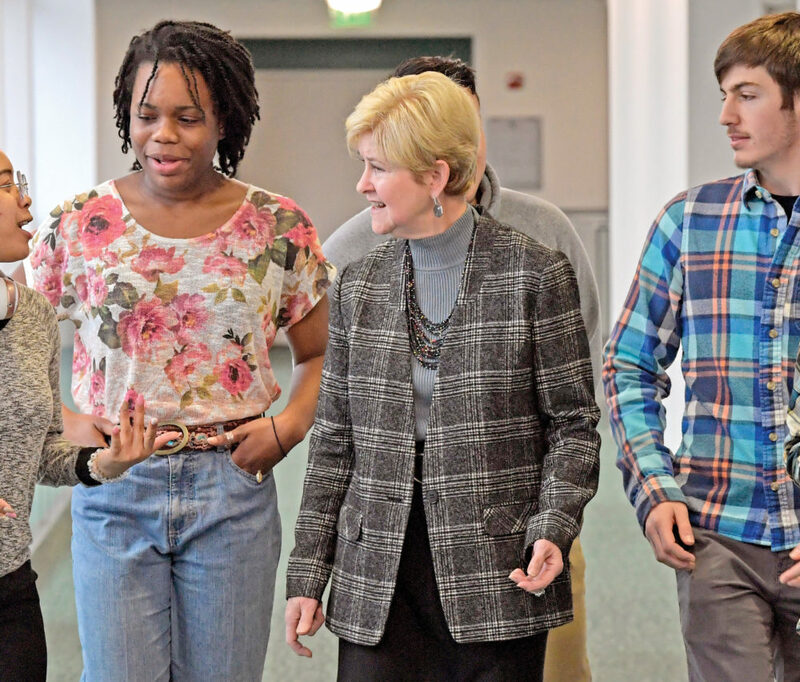 Walker recognizes GGC as another school rich in opportunity. “GSU and GGC both have student success as their number one priority. Both GSU and GGC are accustomed to trying new pedagogical techniques and using technology to enhance student learning,” Walker said. Georgia State offers programs such as the Initiative for Maximizing Student Development that engages underrepresented groups in science, initiated by neuroscience professor Kyle Frantz. Walker foresees similar projects blossoming at GGC’s campus. GGC currently implements a Grizzly Opportunities for Leadership Development (GOLD), which prepares students for college and community leadership roles through training them with personal development programs, institutes and volunteer activities. Georgia State’s influence could initiate collaboration, if not a merge, though Georgia State far exceeds GGC in size. “GGC is much smaller than GSU, of course, with around 12,500 students. Our chief difference is that GGC is not a research university and there are no graduate programs. I am not aware of plans for a merger, but I do think there are certainly opportunities for collaboration,” Walker said. Since Georgia State and Georgia Perimeter College’s merger, associate degree graduation rates from Perimeter have increased by 5 percent. Georgia State has initiated analytics tracking for Perimeter students to expand the university’s Panther Retention Grant program. The University System of Georgia’s Chancellor Hank Huckaby said student support prompted the merge between a research university and access institution. Additionally, the merge cemented Georgia State as the No. 2 largest university in Georgia. With larger student success and campuses, the merge naturally rakes in more revenue for Georgia State. Besides merges profiting students with more resources, merges also profit the USG. “The combining of a research university with essentially an access institution has been done and is being done in major large urban universities in other parts of the country,” Huckaby said. USG hasn’t suggested a merge between Georgia State and GGC, but collaboration could further propel Georgia State as a leading research university titan through collegiate networking. The Signal reached out to GGC’s former President Preczewki for comment on GGC’s transition and possible merge, but no response was received. Preczewski served as president of GGC since 2014. Under Preczewski’s leadership, GGC’s enrollment grew to more than 12,500 and U.S. News & World Report ranked them No. 10 in the “Top Public School in the Regional Colleges South” for 2019. “Whether it’s national rankings, fund raising or accomplishments of our graduates, GGC has been on a remarkable upward trajectory for over 12 consecutive years,” Preczewski said. Preczewski earned a B.S. in engineering from Cornell University in 1980, an M.S. in engineering from the University of Massachusetts, an M.A. in national security strategy from the United States Naval War College, in addition to a Ph.D in higher education from the University of Missouri. The former GGC president also lead two artillery units with the 2nd and 1st infantry Divisions. Preczewski was awarded the Legion of Merit, the Meritorious Service Medal and Airborne and Air Assault wings. “President Preczewski is a true leader in every sense of the word,” said Wrigley. “He brought a wealth of experience to our youngest institution and guided GGC to continue its path of success. He will be greatly missed as an administrator, educator and friend. Currently, GGC’s Presidential Search and Screen Committee accrued 429 responses and hundreds of comments from a survey given to the GGC community for their next president. The USG is currently conducting a national search to secure a permanent presidential replacement for GGC. While GGC continues to scope out their next president, Walker welcomes the younger college with State influence.